A neat and hard to find Vicksburg monument badge. his great badge was worn by Iowa veterans at the Iowa monument dedication at Vicksburg Military Park. The hanger is beautiful unto itself! It is a large, heavy hanger with the coat of arms of Iowa on it. Written around the coat of arms is "The State of Iowa". A large blue ribbon is attached. Written on the ribbon is gold type ink is "Dedication of Iowa Monuments Vicksburg, Miss. Nov. 15th, 1906.". An United States flag is sewn on the ribbon above the writting. Gold fringe is attached to the bottom of the ribbon. 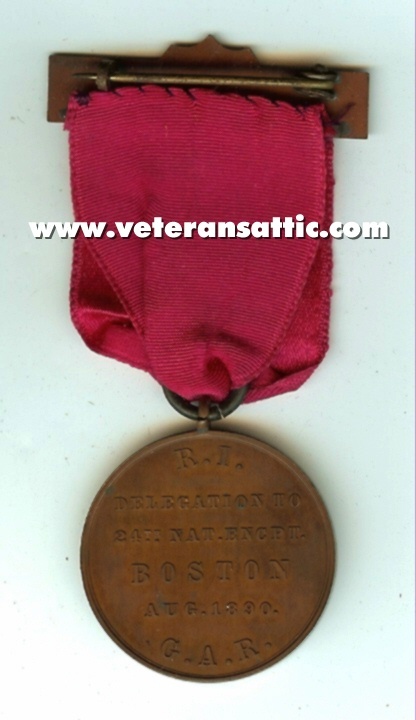 A nice badge worn by the Rhode Island delegation attending the 1890 Grand Army of the Republic National Encampment held in Boston, Massachusetts. The hanger of this badge has an anchor nad "Rhode Island - HOPE". A red ribbon is attached to the hanger. A drop is attached to the ribbon. On the drop is the bust of Benjamin F. Davis, 1890 Department Commander. On the back of the drop is "R.I. Delegation to 24th Nat. Encpt. - BOSTON - Aug. 1890 - G.A.R.". The ribbon on this badge is in great condition. 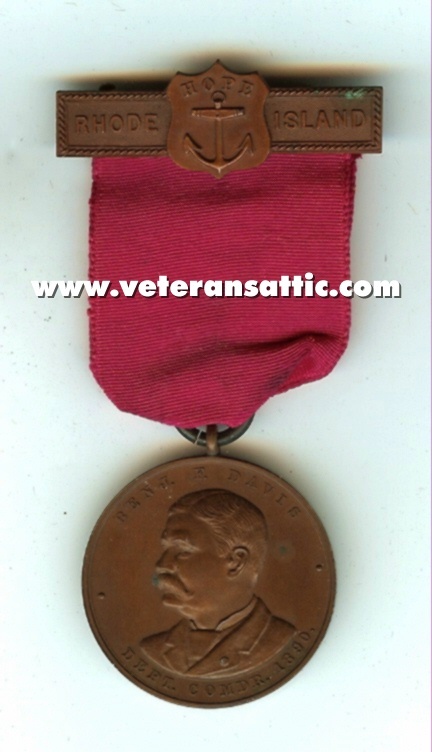 Normally the ribbon is in poor condition on this badge but this one is in great condition. We now accept PAYPAL for those of you who would like to use credit cards! Please send to vann@veteransattic.com . Your satisfaction and happiness is our major concern. We will be glad to refund your purchase price if you are not happy with your purchase if returned within fifteen days of your receipt. You can order through our web site or you can call 803-431-1798 for your order. Sales are complete when we confirm items are still in stock. We ship using the United States Post Office.